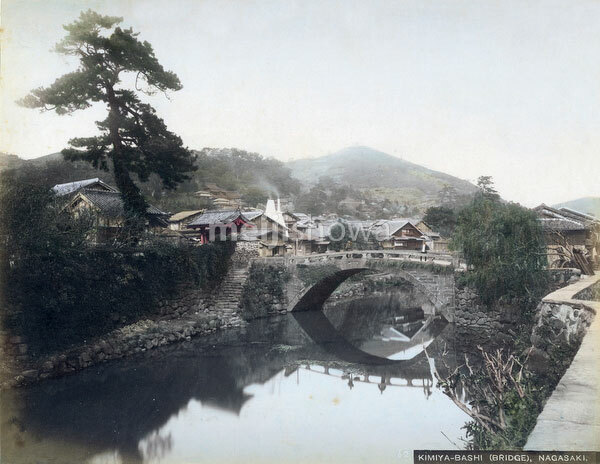 Amigasabashi Bridge (編笠橋) over the Zeniyagawa River (nowadays called Nakashimagawa River) in Nagasaki. The arched stone bridge, built in 1699, connected Imahakata-machi (今博多町) with Motokamiya-machi (本紙屋町). It was destroyed by the great flood of Nagasaki in 1982 (Showa 57). The bridge derives its name from men visiting the red-light district that used to be located here. They would be wearing fuka amigasa hats (bamboo hats) to conceal their face. In the background Suwa Shrine can be seen on the mountain slope.